Here is the short review: I cannot stop listening to this album. It is spectacular. Two enthusiastic thumbs up. Would recommend! 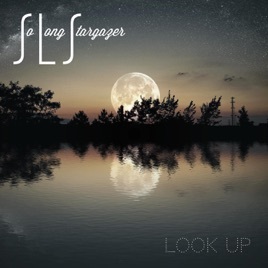 This is a bold statement, but if you can imagine Jonathan Larson’s ghost collaborating with Alan Parsons and Amy Lee from Evanescence, then you have a sense for what So Long Stargazer brings to the table with their debut album, Look Up. It is a true, honest-to-goodness album. Songs flow from one to the next and build on each other while threading a narrative about two people who are locked in orbit around each other, at times colliding in heartache or, at their apogees, contemplating life without the other. It is a powerful combination of expert musicianship, soaring vocals, and beautiful storytelling wrapped up in an intimate rock opera. The first three songs feature Chase McCants as the lead vocalist. The low-hanging adjective would be soulful. His voice is rich and buttery smooth in his low range, inspiring and nimble when he climbs higher. This would be an amazing album if he were alone, but in the three-act structure of the story, the band seems to revel in saving Kristen Green’s voice till the fourth song, like a secret weapon that elevates the work. Her voice is clear as a bell, sometimes youthful and yearning, sometimes wise and soothing. Their blends during duets are gorgeous. The band members’ theatrical background shines through. Without copying their influences, they possess the pathos of Rent, the intertwined couple reminiscent of The Last 5 Years, and the ticking count-in and count-out that bookends Tick… Tick… Boom! Okay, that last one is more of a rip off, but I’ll let it slide because they handle it so well. There is an uncredited third vocalist in Tommy Davis’s guitar work. Listening to his allegro rifts, thoughtful phrases, and powerhouse chord progressions, I am reminded how much I miss thoughtful guitar work in modern pop music. This guy jams and wails. Drummer Nick Wray opens the album with a Joey Kramer-esque thumping beat. The musical landscape here is complex, and he keeps it breezy or smashes hard depending on the mood. I don’t know if he has a jazz background, but the way he collaborates through his kit with the other musicians feels instinctive and bright, never dominating. I’m curious when a band doesn't adhere to the traditional roster of guitar, bass, and drums. McCants’s synthesizer and Green’s keyboards provide the low end, but there are a few moments when I wonder if the deep drive of a bass player could provide even more gravity. The music fluctuates between sounding like independent rock and a Broadway rock opera. While this isn’t a religious album, the contemporary Christian sound occasionally creeps in, but thankfully not too often. There is real magic here. Some of the songs break into instrumental explorations before crashing back into the refrain. Others end with inventive codas. It is a delight to listen to, and I find myself letting it play through on repeat. The narrative is about a couple who ends then rekindles their relationship. Neither of them do well emotionally without the other, but the woman seems to understand that at this point in their lives they are better off apart, something he responds to by retreating into darkness. I get the sense that the two of them are fairly toxic together, sometimes mistaking their chemistry for true love without recognizing what needs to be fixed. They are a spark-and-powder-keg couple. Incredible first album from this group. Love this album. It’s been on repeat since it was released!